So Black Dog saves me from having to do some scratch-building, as I had planned on building this exact tank. 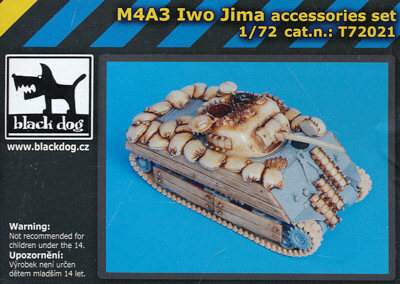 This very neat accessory set depicts an M4A3 on Iwo Jima protected by sandbags, wood planks, spare track links, and anti-mine nails on all the hatch covers. All of these measures were seen on many 4th and 5th Tank Battalion tanks on Iwo, but the particular layout of the wooden planks in this kit most closely resembles "Davy Jones" of the 5th Tank Battalion. 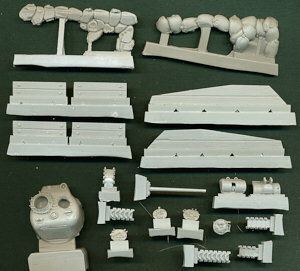 (Note, however, that Davy Jones did not have the spare track links on the front hull; only on the turret.) Minor modifications to the wood armor could easily give you "Tokyo Express" as well. If you leave off the wood armor covering the wheels, then you could model any number of Iwo Jima Shermans. Once again, Black Dog's resin is really top notch. I applaud them for attempting to replicate the fine nails welded to the hatch covers, but their ambition was superior to their packing technique, and the majority of the nails were broken off in transit. Honestly, I'll probably replace them with very fine snippets of brass wire anyway, to get a more realistic scale appearance. Since this set is designed to modify an M4A3 76(W), a new 75mm turret is included. This turret was modified from a Dragon high-bustle turret and includes a complete gun mount. No mention is made on the box which kit this set is intended for, but the boxart depicts a modified Dragon kit. The sandbags are molded to fit precisely on the hull, so I assume it is a Dragon hull, but with a little putty, it will be easy to modify for a different Sherman kit. All in all, and excellent set.